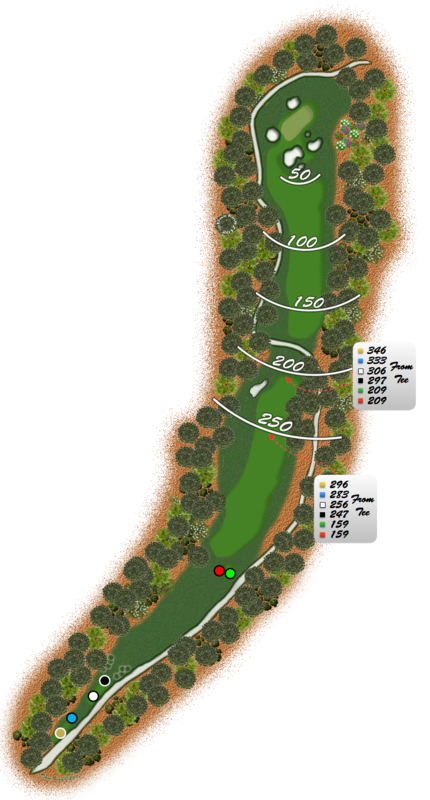 One of the more dramatic holes in the area, this par 5 can be intimidating but is not hard if played correctly. Both tee shot and second shot can take advantage of the slopes from the right and downhill, leaving a short pitch to the green, but anything towards the left side risks finding trouble. Long hitters can benefit from the downhill slopes and reach the green comfortably in two. A weak shot to the green may be swallowed up by the small pot bunker just in front.